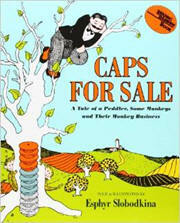 Caps for Sale is a timeless classic, in print for over fifty years, and beloved by generations of readers. This easy-to-read story about a peddler and a band of mischievous monkeys is filled with warmth, humor, and simplicity and teaches children about problem and resolution. Children will delight in following the peddler's efforts to outwit the monkeys and will ask to read it again and again. This is an excellent easy-to-read book that includes repetition, patterns, and colors, perfect for early readers. Design a way that can help people who are hungry and have no money to buy food. · What were the Monkeys thinking was happening when the peddler got angry and was shaking and stamping his hands and feet? · Was the order of the caps on the head of the peddler of importance? · Should the peddler thank the monkeys for returning the caps? How many ways could we arrange the caps on his head?